Visionary iGaming have 3 different versions of Live Blackjack. Strictly speaking only two of them are played against live dealers as the third is an RNG game. I mention it only because it’s packaged with the other two versions. I’ll begin by saying that Visionary iGaming live blackjack is unique. They are the only provider to offer something called Blackjack with Early Payout, where you’re able to cash in your hand before the dealer has played his. It’s a more advanced version of Blackjack Surrender. So you can cash out for a profit rather than just getting half your stake returned to you when you surrender. For that reason and others I’ll go into later it’s well worth playing their version of Blackjack. Advantage players can play the odds better and get a return on potentially losing hands. This is a three handed unlimited game, where multiple players play the same hand. You’ll never get a problem getting a seat and you play the hand as your own. Other players decisions have no impact on your hand. This is a more traditional 7 Seat Blackjack with Surrender. You can surrender your hand and get half your stake back as long as the dealer doesn’t have Blackjack. The tables for this version are limited so getting a seat can be a problem at busy times. The game has Bet Behind though so you can play even if you don’t have a seat. This is the RNG game that I mentioned. It’s a 7 seat game with Surrender, but played against the computer, not a live dealer. This is a version of Blackjack that is unique to Visionary iGaming and casinos using their software solution. Early Payout – As hands are dealt they are compared with the dealers up card and given a cash value. The cash value of the hand can change as you take more cards, so if you improve your hand the cash value will go up, if it weakens it then it’s likely to go down. You have the choice of taking the cash value or playing the hand out to it’s conclusion. In most cases the cash value offered will be less than you would get if your win the hand against the dealer in normal play. Three hands can be played by an unlimited number of players. You’re decision with a hand are unaffected by other players playing the same hand, so it’s a very effective way of enabling loads of people to play. The game is played to European Rules, where the dealer only takes one card. It’s played with 6 Card decks that are manually shuffled by the dealer or an assistant wen approximately half the shoe has been played. The dealer has to hit on a soft 17 and will stand on a hard 17. You can double on any card including Splits. Split Aces get one card. Last 10 results for each hand showing win/lose/draw/BJ. The is a more standard 7 seat game of live Blackjack with the additional option of being able to Surrender your hand during game play. 7 seats are available and you can sit at up to three. The game is played with 6 decks that are shuffled by the dealer or an assistant when approximately half of the shoe has been dealt. Vegas Rules are employed where the dealer takes two cards at the initial deal. Dealer checks for Blackjack when showing an Ace. Dealer hits on soft 17 and stands on hard 17. You can Surrender your hand at any time during the game round for half your stake back. For example you might use it if you have 16 and the dealer has a ten up card. Blackjack Side Bets of 21+3, Perfect Pairs and Bet Behind. 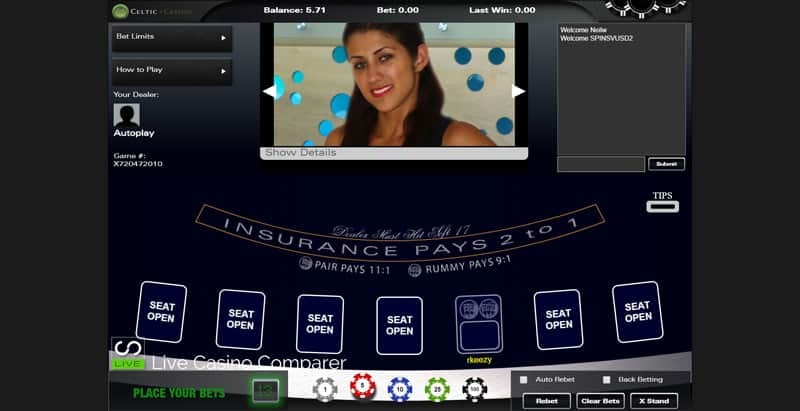 The Bet Behind facility can be used by players at the table and those waiting for seat. You can place a Dealer Tip bet. This increases as you double or split your hand. This is a 7 Seat RNG version of Blackjack – Not Live Dealer Blackjack. Double on anything including Splits. Blackjack Side Bets of 21+3, Perfect Pairs and Bet Behind. 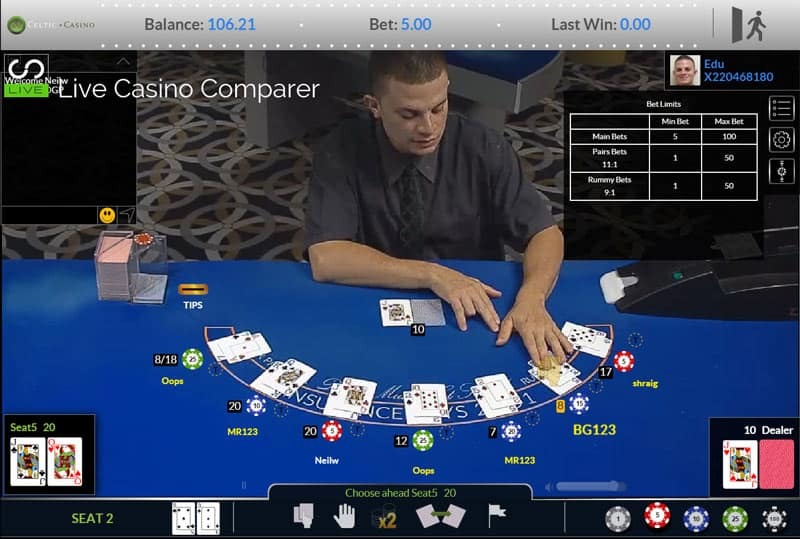 There’s two different playing interfaces for the live blackjack. 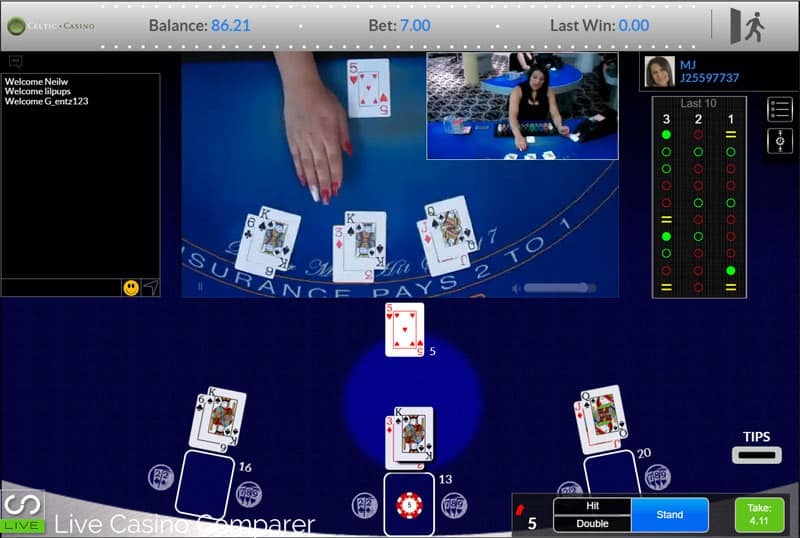 One is in full screen HD mode and the other is displayed as a mixed mode, with a smaller image of the live dealer and table. Both work as effectively as each other. The standard settings are the same on both interfaces. The playing rules can be displayed in a pop out window, as can the stake ranges for the table your playing on. Dealer chat is enabled if you have money in your account to play. Switching on / of the Blackjack card animations. Auto hit 8 or less. Auto stand on 18 or more. These are nice little touches but not that useful as I’d possibly want to double depending on what the dealer has and how my 8 or less was made up. The animations are fun, but I personally don’t like them so have this switched off. Blackjack Basic Strategy has been integrated in all the games so when it’s your turn to play you’ll be advised on the action you should take. It’s not compulsory so you can choose to ignore the advice and play the hand in your own way. Again, it’s a nice addition and particularly useful if you’re just starting to play the game and not quite sure how to play the hand. The great thing with this solution is that if you disconnect and can’t play your hand after your bet has been accepted it will be play for you using basic strategy. You could say that the Visionary iGaming Live Blackjack solutions are the best out there. Certainly they are hard to beat with versions that allow Surrender and the unique Early Payout function. They’ve got the basic rules right as well, as you’re able to double down on any hand value and you can double after a split which is quite rare. The only downside for me is the European Rules on the Early Payout game and the fact that the cards are displayed clearly on the HD versions. There just seems to be too must glare for the lighting in the studio. At busy times you may struggle to get a seat at the lower staked HD Blackjack table, but you can play Bet Behind. You find Visionary iGaming Live Blackjack at the following casinos. Baccarat 1 – 500 mBTC None To see the latest Live Casino promotions. Click Here.